This is our latest engine which is based on our popular KS90. This particular engine has a 90 degree V a arrangement between the displacer piston and the power piston. A brass tube connects the power piston to the main chamber. Air flows along the tube when the pressure inside increases and reduces. 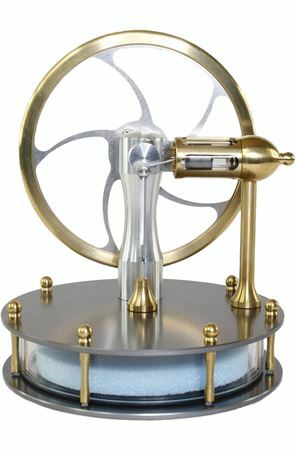 The engine has distinctive brass finials around the top plate, this style is continued at the end of the power piston. Having the pistons at 90 degrees enables a reduction in the overall height of the engine, resulting in a more squat appearance.